Would you like to value a different car? Searching in vain to find a suitable place to sell your car in Coventry? If so then look no further. At wewantanycar.com, we are geared towards offering the most comprehensive and reliable car buying service to all of our customers. If you are looking to sell a second hand car in or around the Coventry area, then don’t look any further than wewantanycar.com. Get the wheels revolving now by simply entering your car’s registration details into our valuation tool situated on the right hand side of this page. By filling out our online valuation form it allows our team of experts to accurately determine the value of your car. Remember, this valuation is free and there is no obligation to sell your car until you are happy. If the valuation matches your requirements then the next step is to book an appointment at your local Coventry branch. 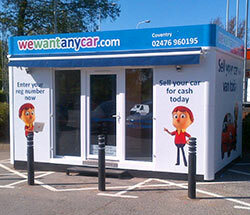 Our Coventry office is conveniently located outside the ring road on Austin Drive on Sainsbury's car park. To take the next step to selling your second hand car in Coventry then give us a call on 02476 960195 or email the team at coventry@wewantanycar.com. It was really easy to sell my car! Anthony at the Coventry branch was pleasant, not pushy and although the initial offer was well below anticipated we reached a figure close to what I wanted, about 10% away - acknowledging that I would have the hassle of trying elsewhere and time involved I felt this was the better option. Pleased overall with the speed and the way Anthony assisted. Easy and quick transaction, bettered part ex , fine . Easy to find location. Full explanation of valuation of car. Offer for car very close to what wanted and money in account as promised no issues. Very good service . Paid money in to account same day . very good service .your staff very informative and provide excellent service.I am very pleased with your service.I will recommend to others as well. The website is simple and clear. I got to the depot and the very friendly person looked over the car, and sat in front of me at the computer, entered a true and fair summary of the car into it, and the system agreed with the summary I selected on the website. Was paid the value quoted when I booked the appointment! A very pleasant experience, far far better than their well-known competitor, with whom I have had two poor experiences. Anthony at the Coventry branch was amazing, didnt try to bull s**t me like the scruffy guy at webuyanycar did. Very professional, would definately recomend to others. I think Anthony should be commended for his great work!!! !